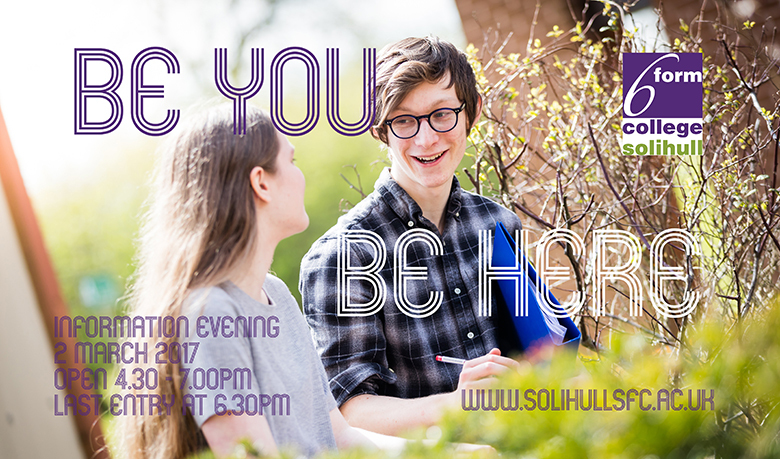 It’s the final opportunity for prospective students and their parents to visit The Sixth Form College, Solihull before the application deadline, as Information Evening takes place on Thursday 2 March 2017. This event takes place from 4.30pm – 7.00pm (last entry at 6.30pm) in the College’s Sports Hall and Dance Studio. The event is similar to an open evening, in that it is open to all prospective students and parents. However, not all areas of the campus will be open for this event; instead all courses will have stands set up in our Sports Hall for visitors to visit. Teachers and students will be on hand to answer questions that would-be applicants may have ahead of making their College application. The deadline for applications for a September 2017 start is 31 March 2017. Those that apply online before this deadline are guaranteed to be interviewed, provided they look set to meet our entry requirements and are in receipt of a good reference from their school. Students that apply after the deadline risk having their application put onto a waiting list, pending availability on their courses of choice. Staff from our Admissions Office will be available at Information Evening to answer questions about the application process. There will also be staff on hand to offer specialist advice about careers support, academic coaching support and additional learning support. Additionally, there will be information about enrichment, specialist academies and our Career Passport scheme available for visitors. Principal Paul Ashdown and Vice Principals Janice Hamilton and Martin Sullivan will also be giving talks at 4.30pm, 5.15pm and 6.00pm in our Dance Studio. Further information about this event is available online when students pre-register for this event.